My knowledge of European-based mythology is very sketchy. I am familiar with some figures of both the Greek and Roman mythologies. But my knowledge of Norse mythology is even less. As for the many characters from Marvel Comics, I barely knew about any of them – aside from “SPIDER-MAN”, until the past decade. One can only imagine my surprise when I learned that one of Marvel’s more successful super heroes was the Norse god, Thor. Based upon the Norse mythology and the Marvel Comics character, “THOR” is an origin tale about the God of Thunder (and several other things), and how he ends up on Earth and becomes affiliated with S.H.I.E.L.D. The story begins in New Mexico, when scientist Jane Foster, her assistant Darcy Lewis and mentor Dr. Erik Selvig stumble across a figure that has tumbled from a wormhole in the sky. That figure turns out to be Thor, the Norse god that was exiled by his father, Odin, king of Asgard. Earlier, Thor had been preparing to ascend to the throne of Asgard, but his ceremony was interrupted when Frost Giants attempted to retrieve the source of their power, the Casket of Ancient Winters, which had been taken by Odin in an earlier war. Against Odin’s order, Thor traveled to Jotunheim, the Frost Giants’ realm, to confront their leader Laufey; accompanied by his brother Loki, childhood friend Sif and the Warriors Three – Volstagg, Fandral and Hogun. A battle ensued until Odin intervened to save the Asgardians, which destroyed the fragile truce between the two races. For Thor’s arrogance, Odin stripped his son of godly power and exiled the latter to Earth, accompanied by Thor’s hammer Mjolnir — the source of his power, now protected by a spell to allow only the worthy to wield it. No one was more surprised than me upon learning that actor/director Kenneth Branaugh had manned the helm for “THOR”. Pop culture movie franchises were nothing new to him. After all, he had appeared in 2002’s “HARRY POTTER AND THE CHAMBER OF SECRETS”. But directing an adaptation of a comic book series? Mind you, “Thor” is a different kettle of fish incompare to . . . say “Spider-Man”, “The Fantastic Four” or “Iron Man”. After all, Thor originated as a figure in Norse mythology. However, I must admit that I found it difficult to wrap my mind around the idea of a known Shakespearean actor directing a comic book hero movie. In the end, I believe that Branaugh did a pretty good job. “THOR” turned out to be a solid tale filled with mythology, some first-rate acting, family drama, comedy and action. The best aspect of “THOR” was to me – hands down – the family drama surrounding the main hero and his relationships with his father Odin and his younger brother, Loki. This family drama originated in Thor’s arrogant nature and brother Loki’s discovery that he was an orphan that Odin had discovered in the Frost Giants realm. Despite his discovery that he was a Frost Giant instead of an Asgardian, Loki viewed Thor as an unsuitable heir to the Asgard throne and used Thor’s exile to muscle his way to the throne . . . and, uh Odin’s heart. Another aspect of “THOR” I found interesting was the story line about S.H.I.E.L.D.’s investigation into the wormhole that delivered Thor to Earth and his hammer Mjolnir, which is stuck in the middle of the New Mexican desert like Excalibur. The first encounter between the forces of S.H.I.E.L.D. and Thor during a rainy evening also provided some interesting action. This sequence not only featured a brutal fight to the now mortal Thor and a S.H.I.E.L.D. agent and a cameo appearance by future Avenger member, Clint Barton aka Hawkeye. The New Mexico sequences provided most of the comedy featured in “THOR”. The former Norse god’s interactions with Jane Foster, Erik Selvig, Darcy Lewis and the locals of the New Mexico town where they resided. Ashley Edward Miller, Zack Stentz and Don Payne’s screenplay not only provided a good deal of slapstick humor and witty one-liners for the Darcy Lewis character, but also a variation on the “fish out of water” theme. And If there is one thing that the movie did shine was its production designs and cinematography. Bo Welch did a excellent job in recapturing the rugged setting of the small New Mexican town and the Frost Giants’ realm of Jotunheim, featured in the film. But he did a superb job in his design of Asgard, the realm of the Norse gods. Asgard possessed a sleek, colorful and over-the-top quality that reminded me of what the Art Deco style would look in the hands of Hollywood craftsmen in the 1930s and 40s. And Haris Zambarloukos’ photography did great justice to both settings, especially Welch’s designs for Asgard. Even though I found the movie’s theme somewhat conflicting, I must admit that I found Paul Rubell’s editing rather smooth and well done in both the action sequences and the jumps between Asgard and New Mexico. However, I have yet to encounter a movie that I would consider perfect. And “THOR” was far from perfect. The film’s main problem was that it seemed to have a conflicting quality about it. Because the movie’s setting constantly moved from Asgard to New Mexico and back, it ended up striking me as a mixture of “CLASH OF THE TITANS” and “STARMAN”. And this conflicting style did not seem to balance very well. I could have settled for “THOR” beginning its story in Asgard and remaining in New Mexico until the last scene. Unfortunately, most of the movie’s more important action occurred in Asgard, leaving the New Mexico sequences to bear the brunt of most of the comedy. By the time the movie’s last scene ended, I could not tell whether this was a movie about mythological gods or a comic book hero. “THOR” was a pretty good movie, but it did not exactly rock my boat. I found the story a bit mediocre and conventional. And the problem, if I must be honest, rested with Marvel Comics’ decision to create a comic series about a well-established mythological figure, instead of a new and original character. Also, there were a few performances that failed to impress me. I realize that the three actors and one actress that portrayed Thor’s Asgardian friends – Sif and the Warriors Three – were very popular with moviegoers. Unfortunately, not only did they fail to impress me, I found them rather uninteresting. Poor Rene Russo. Within a decade she went from leading lady to a minor character actress, stuck in the thankless and nothing role of Thor’s stepmother, Frigga. Jeremy Renner as Hawkeye was really wasted in this film. In fact, he did nothing at all, except pose with a bow and arrow. I realize that he will appear as one of the Avengers in the upcoming 2012 film, but he was never allowed to strut his stuff like Scarlett Johanssen in “IRON MAN 2”. Aside from the performances I had earlier mentioned, “THOR” seemed blessed with a first-rate cast. I was surprised to learn that Chris Hemsworth had portrayed James T. Kirk’s doomed father in the 2009 movie, “STAR TREK”. His George Kirk had been so dull. Fortunately, portraying Thor gave him the opportunity to shine in a complex role that developed from an arrogant and over-privileged prince with an aggressive sense of self to a more compassionate and wiser man who had fallen in love. For an actor with only eight or nine years of acting experience – most of them on television – Hemsworth more than held his own against the likes of Oscar winner Anthony Hopkins. And those scenes that featured Thor’s encounters with Jane’s van conveyed Hemsworth’s talent for physical slapstick humor. As an on-screen fighter, he struck me as a bit crude, but I am certain that he will improve with time. Natalie Portman gave a charming and humorous portrayal of Dr. Jane Foster, the astrophysicist who is not only obsessed with her work, but eventually finds love with Thor. Mind you, I did not find her character particularly exceptional. But I am glad to say that Portman tried all she could to make Jane an interesting personality. But one of the two best performances came from Tom Hiddleston’s portrayal of Loki, Thor’s resentful and conniving younger brother. Loki was definitely the movie’s main villain. The joke he had played (luring three Frost Giants to the chamber that held the Casket of Ancient Winters) on Thor’s ascension ceremony not only led him to the discovery that he was an abandoned Frost Giant infant taken by Odin, but also gave him the opportunity to discredit Thor and take the latter’s position as Odin’s more cherished son. Mind you, I cannot say that Hiddleston conveyed Loki’s mischievous sense of humor effectively. But he did handle Loki’s conniving nature, jealousy toward Thor and outrage over the story behind his true nature with great skill and subtlety. Other outstanding performances came from Idris Elba, who portrayed Asgard’s gatekeeper, Hemidall; Kat Dennings as Jane’s sardonic assistant Darcy Lewis; Clark Gregg as S.H.I.E.L.D. agent Phil Coulson; and Colm Feore as Laufey, King of the Frost Giants (and Loki’s real father). I was amazed at how Elba managed to convey all of Hemidall’s emotions and intelligence with very limited movement. No wonder he became very popular with many of the film’s characters. And Colm Feore managed to do something quite similar. He conveyed all of Laufey’s malice and secrecy behind a ton of body makeup. Aside from Hemsworth’s foray into slapstick, the New Mexico sequences featured a deliciously sly and humorous performance by Kat Dennings, who portrayed Darcy. And it was great to see Clark Gregg reprise the role of Phil Coulson for the third time (he made two earlier performances in the two IRON MAN movies). Thankfully, the movie’s script allowed him to be more complex and increasingly sardonic, allowing Gregg to really show his acting chops. Finally, the movie benefited from solid performances by Anthony Hopkins’ majestic portrayal of Odin, Thor’s father, Stellan Skarsgård as Jane’s dependable and practical mentor, Dr. Eric Selvig and Samuel L. Jackson as S.H.I.E.L.D. director Nick Fury in the movie’s post-credits sequence. In conclusion, “THOR” proved to be an entertaining movie and another step toward “THE AVENGERS”, the big Marvel Comics saga for 2012. The movie provided solid direction from Kenneth Branaugh and excellent performances from most of the cast. But the movie’s conflicting genre(s) and somewhat mediocre story led me to realize that I would never consider it to be one of the outstanding releases from Marvel Studios. Many fans of the miniseries have waxed lyrical over this particular episode. And I can see why. Director Tony To did a marvelous job in conveying the chaos, insanity and brutality that the First Marines and the Japanese soldiers suffered during the battle for the airfield to the television screen. I have not seen such a brutal combat sequence since . . . well, since the landing in last week’s episode and the Guadalcanal action in which John Basilone (Jon Seda) earned his Medal of Honor inEpisode Two. Viewers also got a chance to see other interesting scenes that included Sidney Phillips’ surprise visit to the Sledge family back in Mobile; the death of a Marine in Sledge’s company at the hands of his fellow combatants, due to his constant wailings that threatened to reveal their position in the Peleliu hills; another Marine in Sledge’s company who went off the deep end by counting the number of unseen Japanese soldiers to himself; Leckie’s attempt to find a corpsman (Navy medic) for a wounded Runner; the two friends’ reunion aboard the hospital ship; and the growing friendship between Sledge and the very eccentric SNAFU Shelton. Well . . . that is it for Episode Six. Next week, Sledge and company fight the Japanese in the hills of Peleliu. In the eyes of many fans of the trilogy of miniseries based upon John Jakes’ saga, ”The NORTH AND SOUTH Trilogy”, the only miniseries not worthy of the entire saga is the third one – ”HEAVEN AND HELL: North and South Book III”. I wish I could agree with them. After all, the production values for ”Book III” had not been as impressive as the other two. 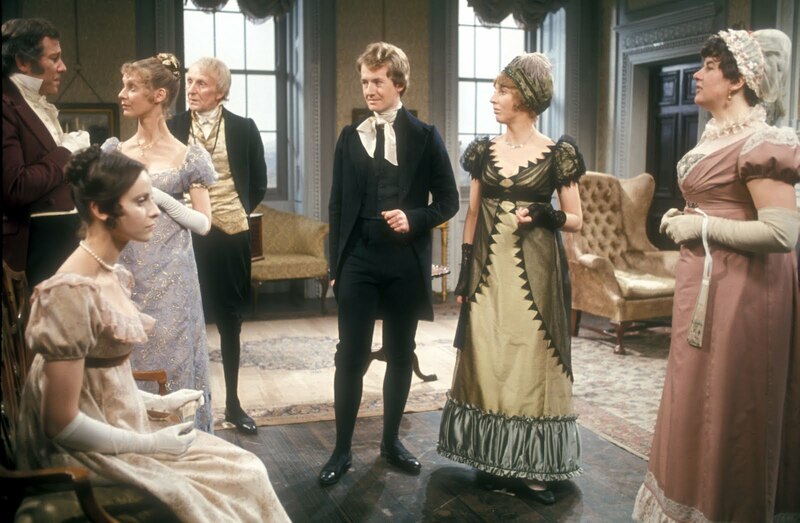 And of the three miniseries, ”NORTH AND SOUTH: BOOK II” had the best costume designs. But looking at the three miniseries from the prospective of a writer, I have finally come to the conclusion that it was ”Book II” (set during the Civil War), and not ”Book III” that ended up being a lot more disappointing to me. None of the three miniseries were exact copies of the novels from which they had been adapted. Changes were made in all three. Despite some flaws, I had no problems with most of the changes in ”Book I” and ”Book III”. But I found some of the changes in ”Book II” to be very questionable. In fact, some of these changes really did nothing to serve the miniseries’ story, except pad it unnecessarily in order to ensure that it would last six episodes. *Around the end of Episode I, Brett Main Hazard (Genie Francis) – a South Carolina belle who had recently married Pennsylvania-born army officer, Billy Hazard (Parker Stevenson) – and her maid, Semiramis (Erica Gimpel), had left Washington D.C. just before the Battle of Bull Run (July 21, 1861). The former had received a written note about Madeline LaMotte (Lesley Anne Down)’s kidnapping by her estranged husband (David Carridine) and the injuries that Brett’s mother – Clarissa Main (Jean Simmons) – had suffered following a barn fire at the Main’s South Carolina plantation, Mont Royal. Brett and Semiramis finally reached Mont Royal in November 1861. I have a lot of problems with this. Washington D.C. and not to Brett’s older brother, General Orry Main (Patrick Swayze) in Richmond? It would have been easier to reach him, since Richmond was inside Confederate territory. 2) Would it have been easier for Brett and Semiramis remain in Richmond and wait for Orry to depart for South Carolina? What was the point of them leaving him a message and continuing their journey south? They would have reached Mont Royal a lot sooner. 3) Why did it take them three to four months to reach South Carolina? It took them at least less than a week to travel from Washington D.C. to Richmond, Virginia – despite being delayed by Union troops. They were on horseback. So why did it take them an additional three-and-a-half months to reach Mont Royal in South Carolina? *Episode I revealed that both George Hazard and Orry Main served as military aides for their respective political leaders – Abraham Lincoln and Jefferson Davis. Between Episode I and early Episode III, George provided information to Lincoln on battle results and on the President’s behalf, interviewed General Ulysses S. Grant in Tennessee, to see if the latter was the right man to take over the Army of the Potomoc in Virginia. George became a field commander right before the Battle of Gettysburg. Orry not only provided battle results and other information to Davis, he also served as some kind of quartermaster and investigator of corruption within the Confederacy. He became a field commander right before the Battle of Sayler’s Creek in Episode VI. I had a lot of problems with this. 1) Although both George and Orry had graduated from West Point’s Class of 1846 and served in the Mexican-American War, they only served for a duration of at least eighteen months. Both men, due to personal reasons, had left the Army by the late winter/early spring of 1848. How on earth did both managed to acquire such high positions – militarily and politically – at the start of the Civil War, thirteen years later? Even the younger members in their families – Billy Hazard and Charles Main – had more military experience before the war – nearly five years apiece. 2) Neither George or Orry had acquired any further military experiences or participated in any political movements or organizations in their respective home states of Pennsylvania and South Carolina, during those thirteen years between 1848 and 1861. 3) Although George primarily served as an adviser for Lincoln before becoming a field commander, Orry served in a confusing mixture of duties that included military adviser, quartermaster, and investigator. What the hell? It almost seemed as if the screenwriters could not make up their minds on what capacity Orry had served in the Confederate Army, before becoming a field commander during the war’s final month. 4) In the early summer of 1863, George became an artillery commander in the Army of the Potomoc. I am aware that he had graduated from West Point near the top of class, ranking sixth. But in 1846, George decided to choose the Infantry in which to serve. His only previous military experience before the Battle of Gettysburg was fifteen months as a junior infantry officer. How on earth did he end up in artillery, with no previous experience in that particular field? George and Orry’s military experiences during the war smacked of a great deal of bad continuity, lack of logic and confusion. *In Episode III, despondent over being unable to see Brett for two years, Billy decides to go AWOL, following the Battle of Gettysburg (July 1-3, 1863) and head south to South Carolina to see Brett. Upon his arrival at Mont Royal, he stays there less than 24 hours and leaves to return to the Army. He returned to duty in Hiram Burdam (Kurtwood Smith)’s Sharpshooter regiment in late April/early May 1864, in time to participate in the Battle of the Wilderness. And I had problems with this. 1) It took Billy less than a month to travel from Southern Pennsylvania (Gettysburg) to Mont Royal in South Carolina. Yet, it took him at least eight to nine months to rejoin his regiment, who were back in Virginia by the time of his arrival. Why did it take him longer to travel from South Carolina to Virginia, than it did for him to travel from Southern Pennsylvania to South Carolina? He was on horseback. 2) Billy had been AWOL from the Army for at least nine to ten months (July 1863 – late April/early May 1864). Why did Colonel Burdan fail to punish him for abandoning his post without permission . . . for so long? In the spring of 1864, the Union Army was not exactly desperate for an increase in manpower, unlike the Confederate Army. In fact, Billy never even faced a court martial or trial of any kind for his actions. His only punishments were a stern lecture from Burdan and being passed over for a promotion to the rank of captain. This is illogical . . . even for a fictional story. *Charles Main (Lewis Smith) and Augusta Barclay (Kate McNeil) first met each other while the former was on a scouting mission for the Confederacy and the latter was smuggling medicine in July 1861. They met again, the following year, when Charles appeared at her farm, wounded. In the spring of 1864, following the Battle of the Wilderness, they began a love affair that lasted until they said good-bye for the last time in February 1865. Two months later, following the surrender of the Confederate Army at Appomattox, Charles returned to Barclay Farm and learned that Augusta had died while giving birth to his son. Charles learned that Augusta’s South Carolina relatives had taken custody of Charles Augustus Main and returned to Charleston. There, Charles took custody of his son for the first time. I have a problem. 1) Charles and Augusta saw each other for the last time in February 1865. When Charles returned to her farm, two months later, her former servant – Washington (John Nixon) – informed him that she had recently died from giving birth to Charles’ son. Yet, Augusta certainly did not look pregnant, during Charles’ last visit two months ago – when the unborn baby should have been at least six to seven months old. And she was wearing a corset. 2) Following his discovery that he was a father, it did not take Charles very long to return to South Carolina and claim his child. Yet, the recently Charles Augustus Main looked at least between one to two years old. If that had been the child’s real age, Charles and Augusta’s son would have been born a year earlier – before they had consummated their relationship in May 1864. *After being driven from Mont Royal by the discovery of a family secret by Ashton Main Huntoon (Terri Garber), Madeline Main (Lesley Anne-Down) settles in Charleston around July-September 1863. The following spring in May 1864, she meets a former slave/refugee named Jim (Bumper Robinson) and his sick mother. Because of this meeting, Madeline decides to offer aid to many of Charleston’s war refugees – whether they are ex-slaves or poor whites. She also learns about Jim and his mother’s personal history. Apparently, they were Tennessee slaves who were freed upon the arrival of Union troops at their former master’s plantation, who decided to make their way to Charleston. Any of the above cities were closer to the plantation owned by Michael’s master and could have provided safe refuge for him and his mother. Certainly not Charleston, South Carolina, which was too far and still Confederate territory by the spring of 1864. 2) The writers could have written Michael and his mother as South Carolina slaves. And yet . . . they would have been wiser to head for Hilton Head, the only safe refuge for runaway slaves in South Carolina, until February 1865. About a month or two following the bombardment of Fort Sumter in Charleston, South Carolina, the public throughout the Union began clamoring for a march against the Confederate capital of Richmond, Virginia; which they believed would bring an early end to the war. Yielding to this political pressure, President Abraham Lincoln ordered Brigadier General Irvin McDowell to plan an advance across Bull Run Creek to face the equally unseasoned Confederate Army near Manassas Junction, under the command of Brigadier General Pierre G.T. Beauregard. McDowell finally buckled under presidential and public pressure and formed an ambitious plan for a surprise flank attack against the Confederate left. Unfortunately, the inexperienced officers and troops failed to conduct a successful flank attack. However, due to the lack of experience of the Confederate troops, they initially found themselves at a disadvantage. The tide of the battle turned when Confederate reinforcements under the command of Brigadier General Joseph E. Johnston arrived from the Shenandoah Valley by railroad. A brigade of Virginians under a relatively unknown colonel from the Virginia Military Institute (V.M.I. ), Thomas J. Jackson, stood their ground and Jackson received his famous nickname, “Stonewall Jackson”, accompanied by Colonel Wade Hampton and his Hampton’s Legion from South Carolina; and Colonel J.E.B. Stuart’s cavalry. The Confederate forces were able to assemble 13 guns for the defensive line, posted on the crest of Henry House Hill. And McDowell ordered the Union batteries of Captain James B. Ricketts and Captain Charles Griffin to move from Dogan’s Ridge to the hill for close infantry support. Their 11 guns engaged in an artillery duel against the Confederate’s 13. Unlike many other engagements in the Civil War, the Confederate artillery had an advantage in this battle. One of the casualties of the artillery duel was Judith Carter Henry, an 85-year-old widow and invalid, who was unable to leave her bedroom in the Henry House. When Ricketts began receiving rifle fire, he concluded that it was coming from the Henry House and turned his guns on the building. A shell that crashed through the bedroom wall tore off one of the widow’s feet and inflicted multiple injuries, from which she died later that day. At approximately 3 p.m., the guns from Captain Griffin’s battery were overrun by the 33rd Virginia, whose men were outfitted in blue uniforms similar to those worn by Union troops. This caused Griffin’s commander, Major William F. Barry, to mistake them for Union troops and to order Griffin not to fire upon them. Close range volleys from the 33rd Virginia and Stuart’s cavalry attack against the flank of the 11th New York Volunteer Infantry Regiment (the late Elmer E. Ellsworth’s Fire Zouaves), which was supporting the battery, killed many of the gunners and scattered the infantry. Capitalizing on this success, Jackson ordered two regiments to charge Ricketts’s guns and they were captured as well. As additional Union infantry engaged, the guns changed hands several times. The capture of Rickett’s Battery turned the tide of battle. At about 4 p.m., the last Union troops were pushed off Henry House Hill by a charge of two regiments from Colonel Philip St. George Cocke’s brigade. To the west, two Confederate brigades from the Shenandoah Valley crushed Colonel Oliver O. Howard’s brigade, which had been occupying Chinn Ridge. General Beauregard ordered his entire line forward. McDowell’s force crumbled and began to retreat. The retreat was relatively orderly up to the Bull Run creek crossings, but it was poorly managed by the Union officers. Artillery fire overturned a Union wagon on a bridge spanning Cub Run Creek and incited panic in McDowell’s force. As the soldiers streamed uncontrollably toward Centreville, discarding their arms and equipment; McDowell ordered Colonel Dixon S. Miles’s division to act as a rear guard, but it was impossible to rally the army short of Washington. In the disorder that followed, hundreds of Union troops were taken prisoner. The wealthy and political elite of nearby Washington D.C. had come to picnic and watch the battle, expecting an easy Union victory. When the Union army retreated in disorder, panicking civilians blocked the roads back to Washington, attempting to flee in their carriages. Since the Confederate forces were also highly disorganized, Beauregard and Johnston did not fully press their advantage, despite urging from recent arrival Confederate President Jefferson Davis. An attempt by Johnston to intercept the Union troops from his right flank was a failure. Both Beauregard and Johnston squabbled with each other. Davis eventually called off the pursuit. The First Bull Run was the largest and bloodiest battle in American history up to that point. Union forces and civilians alike feared that Confederate forces would advance on Washington, D.C., with very little standing in their way. On July 24, Professor Thaddeus S. C. Lowe ascended in the balloon Enterprise to observe the Confederates moving in and about Manassas Junction and Fairfax. He saw no evidence of massing Rebel forces, but was forced to land in Confederate territory. Northerners were shocked by the defeat of their army when an easy victory had been widely anticipated. On July 22, President Lincoln signed a bill that provided for the enlistment of another 500,000 men for up to three years of service. He also replaced Irwin McDowell with George McDowell, as the head of the Army of the Potomoc. There was little public celebration throughout the Confederacy, as Southerners realized that the war would be longer and more brutal than they had assumed. Northerners came to same conclusion. This month marked the 150th anniversary of the Battle of Shiloh. It was fought between April 6-7, 1862; around Pittsburg Landing, Tennessee. It was one of the first major battles in the Western Theater of the U.S. Civil War. In southwestern Tennessee, the Union Army under Major-General Ulysses S. Grant had found his command camped at Pittsburg Landing, on the west bank of the Tennessee River. Confederate General Albert Sidney Johnston wanted to launch surprise attack on Grant‘s forces and destroy it. Johnston’s second-in-command, Pierre G. T. Beauregardadvised against such an attack, fearing that the sounds of Confederate soldiers marching and test-firing their rifles after two days of rain had cost them the element of surprise. Johnston refused to accept Beauregard’s advice and told him that he would “attack them if they were a million”. Despite General Beauregard’s well-founded concern, the Union forces did not hear the sounds of the marching army in its approach and remained blissfully unaware of the enemy camped three miles away. In the early morning of April 6, 1862; Johnston’s Confederate forces launched a surprise attack on Grant’s forces at Pittsburg Landing. The Confederates achieved considerable success on the first day, due to the Union Army’s state of unpreparedness for an attack. The assault was very fierce and some of the numerous inexperienced Union soldiers of Grant’s army fled for safety to the Tennessee River. Others fought well but were forced to withdraw under strong pressure and attempted to form new defensive lines. Many regiments disintegrated. The companies and sections that remained on the field attached themselves to other commands. General William T. Sherman, who had been so negligent in preparation for the battle, became an important rallying figure for Union troops. He appeared everywhere along his lines, inspiring his raw recruits to resist the initial assaults, despite staggering losses on both side. His division bore the brunt of the initial attack, and despite heavy fire on their position and their right flank crumbling, they fought on stubbornly. The Union troops slowly lost ground and fell back to a position behind Shiloh Church. Although the Confederates seemed to be emerging as victors of the battle, a minor mishap and Grant’s stubborn refusal to crumble under in defeat, led to an eventual victory for the Union. Around 2:30 p.m., General Johnston was leading a charge against a Union camp near a peach orchard, when he took a bullet behind his right knee. Johnston did not believe the wound was serious at the time and instead, sent his personal physician to tend some captured wounded Union soldiers. Although he did not feel anything, the bullet (possibly fired by friendly fire) had in fact clipped a part of his popliteal artery. Within minutes, his boot filled up with blood and Johnston’s staff saw that he was on the verge of fainting. It did not take long before he finally died and command of the Confederate forces fell upon General Beauregard. General Grant was about ten miles down river at Savannah, Tennessee, that morning. On April 4, he had been injured when his horse fell and pinned him underneath. He was convalescing and unable to move without crutches. Grant heard the sound of artillery fire and raced to the battlefield by boat, arriving about 8:30 a.m. He worked frantically to bring up reinforcements that seemed near enough to arrive swiftly, which included Lew Wallace‘s division from Crump’s Landing. However, he would wait almost all day before the reinforcements arrived. Wallace’s slow movement to the battlefield became particularly controversial. Several factors saved the Union forces on April 6. One, their forces under General Benjamin Prentiss managed to hold back a Confederate frontal assault for seven hours at a place called the Hornet’s Nest. Two, Grant kept his cool and did not cave in to the possibility that his army might be destroyed. But more importantly Beauregard failed to take advantage of the Union’s exposed flanks as they pulled back toward Pittsburg Landing, and continued focusing his troops at the Hornet’s Nest. Worse luck for the Confederate Army appeared at Pittsburg Landing on the evening of April 6. Reinforcements underGeneral Don Carlos Buell arrived. Beauregard had been forewarned at the possibility of Buell’s arrival, but he decided to accept the report that the Union commander was on his way to Decatur, Alabama. By the morning of April 7, Beauregard had no idea that his forces were outnumbered by both Grant and Buell’s forces. As he prepared to finish Grant by the banks of the Tennessee River, Beauregard and his men found themselves surprised by a strong counterattack by the Union Army. Beauregard launched a series of counterattacks from the Shiloh Church area by the early afternoon, hoping to ensure control of the Corinth Road. Although the Union Army’s right was temporarily driven back by these assaults, Union troops seized the road junction of the Hamburg-Purdy and East Corinth Roads, driving the Confederates into Prentiss’s old camps. Beauregard’s final counterattack was flanked and repulsed when Grant moved Colonel James C. Veatch’s brigade forward. Realizing that he had lost the initiative and that he was low on ammunition and food and with over 10,000 of his men no longer in action, Beauregard knew he he was in serious trouble. He withdrew the Confederate forces in an orderly fashion back to Corinth, Mississippi. The exhausted Union soldiers did not pursue much past the original Sherman and Prentiss encampments. By the late afternoon of April 7, the battle had ended. Long afterwards, Grant and Buell quarreled over Grant’s decision not to mount an immediate pursuit with another hour of daylight remaining. Grant cited the exhaustion of his troops, although the Confederates were certainly just as exhausted. Part of Grant’s reluctance to act could have been the unusual command relationship he had with Buell. Although Grant was the senior officer and technically was in command of the overall Union forces in that part of the Western theater, Buell made it quite clear throughout the two days that he had been acting independently. Newspapers vilified Grant for allowing his army to be caught offguard on the morning of April 6. Journalists began spreading the false rumor that he had been drunk during the battle. Many credited Buell for taking command of the Union forces on April 7. Sherman was hailed as a hero. Grant’s career suffered a temporary setback when head of all Union forces in the Western theater, General Henry W. Halleck combined and reorganized his armies and demoted Grant to the powerless position of second-in-command. Halleck remained in charge, until he was promoted as general-in-chief of all Union forces and called back to Washington D.C. Beauregard was relieved of command of the Confederates’ Army of Mississippi around late May/early June 1862. Braxton Bragg assumed his old position.